An incisional hernia, as the name suggests, occurs at the site of a previous incision in the abdominal wall. This type of hernia is the result of the muscles around the old incision breaking down. Incisional hernias can range in size from small (1 inch) to large (8 inches). An incisional hernia can occur immediately following surgery, or may not become apparent for years. The most common procedures which result in an incisional hernia are intestinal surgery, vascular surgery, an appendectomy or laparoscopy. Surgeons, nationwide, often refer their patients to the Hernia Center of Southern California due to our high rate of success with repairing incisional hernias. A bulge may not be visible at first; but pain, whether sharp or dull, will usually be an early warning sign. Relentless discomfort or nausea related to any type of abdominal bulge is often a sign that the hernia has become strangulated or incarcerated. When this happens, you should seek medical attention immediately. Since suturing (tension) can be the cause of some incisional hernias, it is highly advised that incisional hernias be repaired with the open “tension free” mesh technique to avoid future recurrence. Incisional hernia repairs may also be performed using laparoscopy. With the open technique, or laparoscopy, the herniated tissue is pushed back inside, then the mesh is placed against the interior abdominal wall. The entire area is then reinforced and strengthened by extending the mesh so it reaches well beyond the hernia’s edge. Large and/or complex incisional hernias often require general anesthesia instead of local anesthesia. A comprehensive examination and evaluation are recommended to correctly outline the operational approach involving large and/or complex incisional hernias for each individual. Dr. Albin is a well recognized expert in incisional hernia repair. 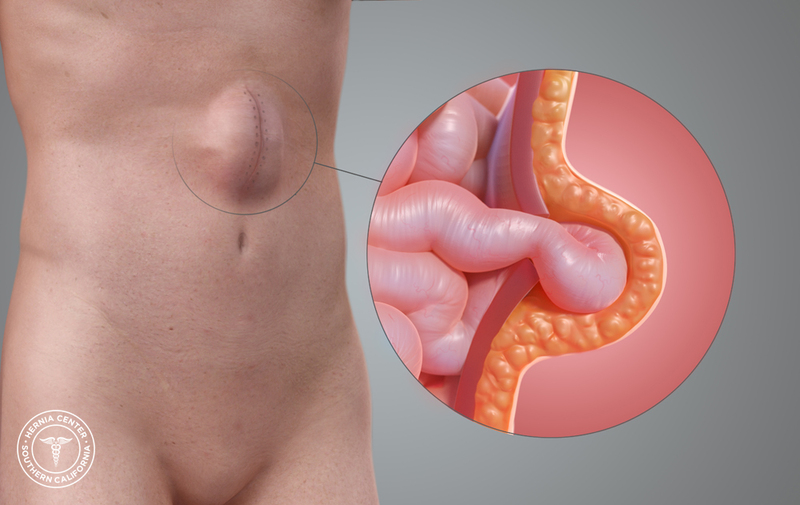 The Hernia Center of Southern California specializes in all types of advanced open and laparoscopic hernia surgery. Dr. Albin has performed over 12,000 hernia surgeries in 25 years. His surgical practice is limited to the diagnosis and treatment of hernias. He is exclusively a hernia surgeon. Patients see Dr. Albin from Los Angeles, Orange County, Riverside, San Bernardino and San Diego Counties as well as throughout the United States. The Albin Tension Free Mesh Technique is recognized worldwide.